As I imagine for most human beings with body temperature in normality, my desire to live and do anything, including writing on the blog, is inversely proportional to the temperature rise. I do not know if you are around Italy, here in Salento, it is humid and warm, or we can call it austerity for a month and in my house there are 976 degrees perceived -_- we are Equipped for an air conditioner, but between one problem and the other it is currently up to us to have a fan running hot 24-24 h, if it is true that hell is definitely something very similar to this. Perhaps though, since my is a beautyblog (however farocco) it is the case to stop it with the weather report and related disagreements and laments and go to more topics in the subject. 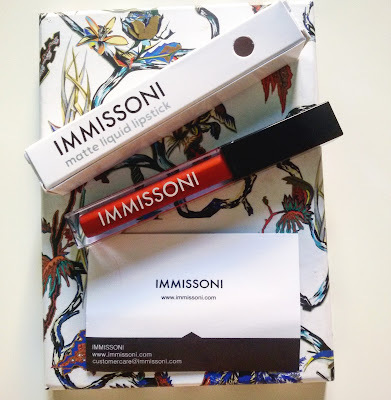 Today I talk to you about my collaboration with IMMISSONI, an English brand that produces and sells Liquid Lipsticks, Fake Eyelashes, a Set of Brushes and T-Shirts in Makeup. Initially, the range of shades of liquid lipsticks proposed was quite limited, but I noticed that as it is growing, more and more recently have come also three metallic colors, as it imposes the must of the moment, very interesting and particular. When I was kindly given the opportunity to choose a liquid lipstick (that is ... ehm ... not exactly a few days ago) however, these metallic lipsticks, which I am curious about, were not yet in range, so in my choice I'm oriented on a matte of a colour I think can be defined as a timeless classic one that's fine at every opportunity: Date Night. 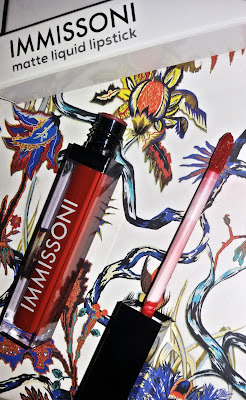 IMMISSONI describes it as follows: Date Night is a beautiful shade of red, rich and high pigmentation. It is suitable for all skin tones. 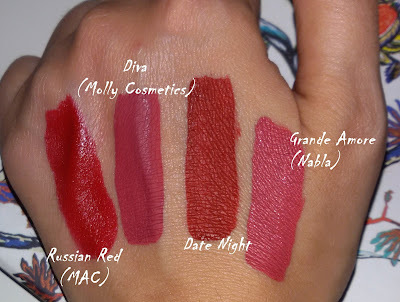 Perfect with lips bordered with a brown or dark red pencil. High coverage, full and long lasting. 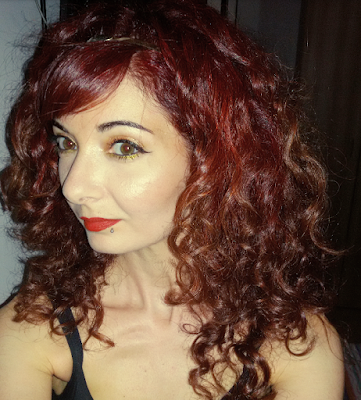 Date Night applies easily, passing from a creamy texture to a light, long-lasting dye that becomes completely dull. It's not sticky, it does not dry your lips and wear it is absolutely comfortable. In practice IMMISSONI has already said everything in this brief but effective description. However, I will also add a few words on the packaging that combines practicality with elegance: we have a tube in the shape of a parallelepiped (ie squared with respect to the most widespread cylinder) with black cap and transparent body which immediately reveals the colour, with a white sleek box and lettering of the brand name. The applicator sponge from the classic gloss is a standard size, which allows precise application and all in all pretty quick, I generally do not outline with a pencil but I am unable to have a fairly outlined result. One pass is sufficient to have a full coat and a full color and although long lasting, if after many hours or eating comes the colour from the edges need a slight retouch and stratify without creating purples and disparities over the Parts in which color is left (this is a good quality for nothing, rarely found in liquid lipsticks). 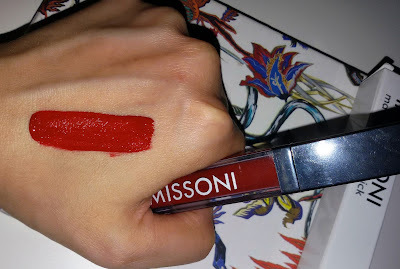 I confirm, as IMMISSONI says, that in the first few hours it does not dry out the lips and is very comfortable, it does not crumble either.